I love pickles, and fresh, home-made pickles are even better! 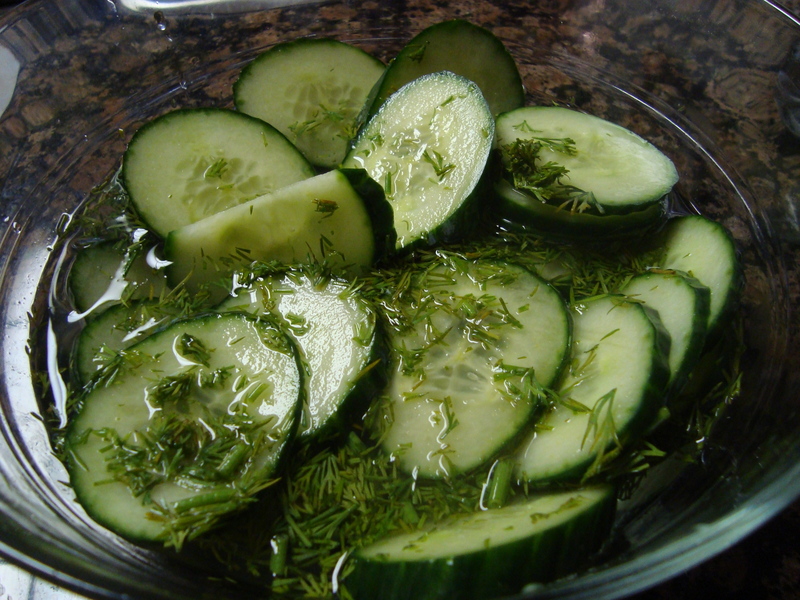 I had an English cucumber and some dill in my fridge, and these sounded like a quick, refreshing treat. They’re great on their own, or you could pair them with a pulled pork sandwich, a chicken salad sandwich, or make a mini grilled cheese sandwich, Cuban style. Try the Mexican pickled carrots if you want a pickle with a little more kick! Slice the cucumber into 1/4-inch slices. Place in a colander and salt heavily. Allow to rest for 15 minutes. Meanwhile, combine the water and vinegar in a small saucepan and bring a boil. Remove from heat and stir in the sugar to dissolve. Place the cucumbers in a heat-safe bowl, then pour the water and vinegar mixture over the cucumbers. Toss with as much dill as desired, then cover and refrigerate overnight. These will keep in the fridge for several days. What a super flavorful and delicious looking dish! Fabulous recipe. Thanks for sharing! Also, I’m having a great giveaway today with four potential prize winners, so you should enter!